John Trenchard, assessor and a verifier for Lantra and co-founder of Arbor Venture Training Ltd with over 20 years’ experience is testing the HAIX PROTECTOR PROS ahead of the APF show - so is he impressed? From childhood farms to forests, Arbor Venture Tree Care’s John Trenchard is no stranger to the outdoors, so he was quick to swap his usual boots for the HAIX PROTECTOR PROS earlier this year. Having started working for his father on the family farm and helping his grandfather with tree clearing, John learnt to handle a chainsaw at an early age, so it comes as no surprise that he now has more than 20 years’ experience in the tree care industry. Nowadays for John there is no typical 9-5 working week. He divides his time between working as an arborist, a verifier for Lantra Instructors and training the new generation of arborists with Arbor Venture Training Ltd which he co-founded in 2005. Based in the beautiful surroundings of Hampshire’s New Forest, Arbor Venture Training is a sister company to Arbor Venture Tree Care and a Lantra verified training provider of chainsaw and tree climbing courses for beginners right through to those wishing to brush up on the latest techniques. It is not uncommon to find that comfort is overlooked when it comes to choosing the right safety boot. Cost is often favoured instead but this can lead to discomfort for workers and they don’t last as long as more expensive alternatives. Cheaper is not always better. As John rightly said: “The fact that I know they will last means I’m willing to spend that little bit extra because it will pay off in the long run.” A short term cost saving can lead to more regular purchasing of replacement boots as well as foot injuries and discomfort, all of which distract from the task at hand. It’s therefore important when choosing the right boot that you keep in mind the long term benefits, as well as ensuring that the boot offers the most important features for you. According to the Health and Safety Executive’s chainsaw PPE requirements, safety footwear should have “good grip and protective guarding at the front vamp and instep.” However, as with any PPE and as per the Personal Protective Equipment at Work Regulations 1992, it should be a last resort that is implemented after a risk assessment and attempts have been made to eliminate or reduce the hazard. As a sector, forestry workers face numerous hazards every day, including the use of machinery and tools, lifting and moving, repetitive movement and loud noise forming just some of the stated causes of non-fatal injuries. The risk of injury from machinery and tools was present in 80% of agricultural, forestry and fishing sector workplaces, while slips, trips and falls are the most common non-fatal injury in the agriculture, forestry and fishing sector with 22% of cases. When choosing the right safety boot it makes sense to check that you are not investing in unnecessary safety features. If the only hazard that you will encounter is slipping, it’s most unlikely that your boot will need to have a steel toe cap. With the right features, you can be sure your HAIX boots will be providing long term comfort and safety. 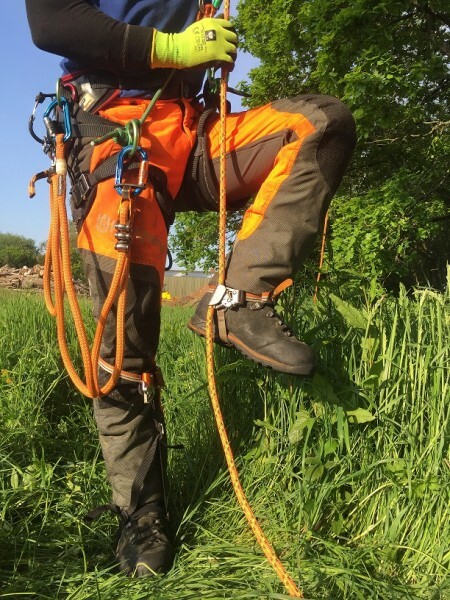 In addition to working seamlessly with forestry equipment, such as the foot ascenders, John also discovered that HAIX® boots incorporate a fast lacing system. Having worked to provide safe and effective boots for the legendary New York Firefighters as well as the German GSG-9 Counter-Terrorist Unit, HAIX® has learnt that time is of the essence when it comes to putting on and removing their footwear, so many boots from HAIX®, including the forestry footwear, benefit from the fast lacing system. As John explained, “You can lace up the lower part and once it is comfortable, lock it in place and lace up the upper part. After you’ve done the lower part the first time, there’s no need to do it again.” Be it as a trainer for Lantra or working with his company, John is always on the go so the fast lacing system isn’t going to stand in his way. Who would have thought that this combination of comfort and stability could be made possible for the forestry community thanks to a little bit of computer science? Right back in 1958, in a bid to protect computer cabling from fine heat fluctuations, Bill Gore launched W.L. Gore & Associates, Inc. He had the vision to explore potential applications for a new polymer material, polytetrafluoroethylene (PTFE). PTFE has since been used to improve stents for percutaneous coronary intervention, aerospace cables and for protective vents in devices such as mobile phones to ensure that they are dust-tight and water-resistant, without compromising the quality of sound transmission. In 1982, Gore Footwear was launched and in the early 1990s HAIX® began using Gore technology in its boots. Gore only approves quality boots that can withstand Gore’s intense testing process. This includes a waterproofing test during which boots are placed in 5cm of water and 300,000 steps are simulated to ensure that no water is let in to the boot. If the boots show any lack of waterproofing, they are rejected and must be reassessed following adjustments. The boots are also tested for breathability to ensure they allow the half a pint of sweat our feet release to be transported away from the feet and out of the boot. HAIX® boots are tested to this exact standard for waterproofing and breathability and as a result can be trusted to keep your feet both dry and warm so you can focus on getting the job done. The ideal foot temperature should be regulated to between 28-32 degrees, even during periods of high physical activity in the trees. Cold and damp feet can lead to swelling, soreness, blisters and in some extreme cases infections, so it is essential that your boots are able to provide the breathability for this. So what is John’s resounding overall opinion? “Excellent comfortable, capable boots that are great value for money.” And you can’t say fairer than that. Having worn the Protector Pros in all weathers, in the air and on the ground, John has put them through their paces on a literal boot camp and has been left more than impressed!